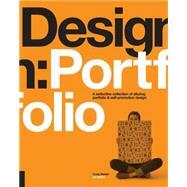 Featuring a curated collection of approximately 300 exquisite designs, along with essays from designers in the field about the essence and importance of a good portfolio design, Design: Portfolio contains mini-workshops that dissect several featured projects and highlight the effectiveness of exceptional design treatments from around the world. Designers will discover the underlying details that make each design so special. This is an exciting new addition to the informative and inspiring Designseries by Rockport Publishers that offers the best of design in practice.